My little holiday began with a short 45-minute flight from Kuala Lumpur’s futuristic low-cost carrier terminal (KLIA 2), located adjacent to the Kuala Lumpur International Airport, to Kota Bahru, a town in the northeast of Malaysia. The futuristic KLIA 2 low-cost airline terminal. We were greeted upon our arrival by the resort staff and were driven to the jetty, a lovely 50-minute drive past gorgeous rice fields, picturesque Malay villages and coconut groves. At the jetty, we hopped onto the boat and off we were. 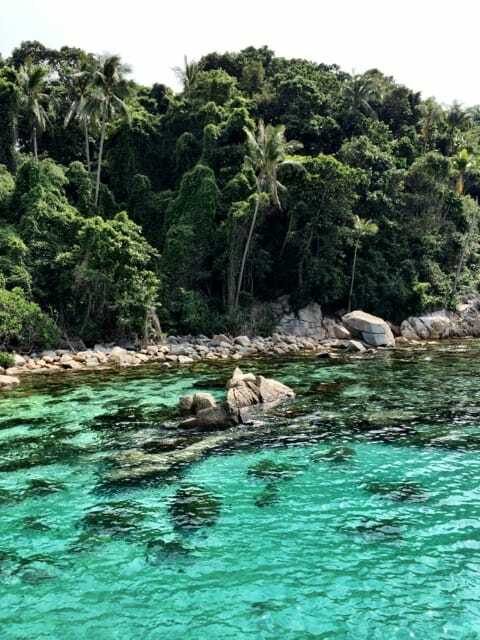 I was very excited as I’d heard so many great things about the Perhentian Islands, often voted as some of the most beautiful islands in the world. Lovely scenery along the way from Kota Bahru Airport to the jetty. Bubu Resort on Long Beach. I was in awe. The colours of the water, ranging from emerald to turquoise, were simply stunning. Large rocks, visibly covered by corals, pierced the surface of the glass-like water. I noticed schools of fish swimming around the corals. Elegant coconut trees, palm fronds swaying in the morning breeze, poked out of the dense tropical jungle. The beach, aptly named Long Beach, was a glorious arc of powdery white sand. It felt like a dream most people (like me) dream of having! Pulau Perhentian Kecil is known as the backpackers island and I soon noticed why; a variety of budget accommodations and cafés lined a large section of Long Beach, and I spotted twentysomethings from around the world lounging on the beach or frolicking in the sea. The Bubu Resort and its sister property, Bubu Villas, are the only higher-end accommodation options on Long Beach. The Bubu Resort is a three-storey building fronting the beach with garden and seaview rooms, whilst the Bubu Villas are a cluster of villas a ten-minute walk away (along the beach) from the resort. The gorgeous seaview from Bubu Resort. The rooms at the Bubu Resort aren’t very large but they’re certainly cosy! 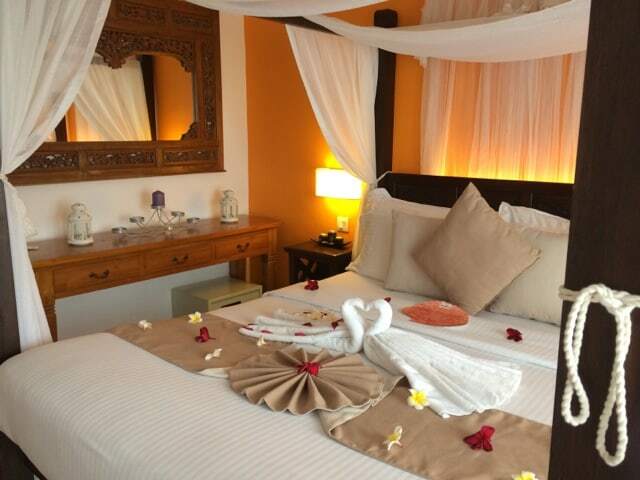 the perfect place for couples looking for a romantic retreat. We made our way to Bubu Villas and were greeted by their friendly staff with ice-cold towels and a cocktail. Lovely! Our thatched-roofed villa was located just off the beach and looked absolutely gorgeous. There was a little terrace with a cosy sitting corner. Two large doors opened to reveal a spacious room with a huge bed and a high ceiling. There was an air-conditioning unit and a ceiling fan. Our little retreat – loved this villa! The villa featured a high ceiling and a large king-size bed. The bathroom was split into indoor and outdoor sections: the bathroom sink was inside whilst the glass shower cubicle and lavatory were outside in the back garden. A wall surrounding the garden ensured total privacy. I absolutely adored the villa. There are a few villas large enough for a family of four but most of the villas were designed to accommodate couples. Add the complete privacy of each villa and its location on a paradisiacal tropical island and what you get is, in my book, the perfect place for couples looking for a romantic retreat. We spent the next few days simply chilling on the beach, going for walks through the jungle (there are several trails), swimming in the crystal-clear sea and sipping on cocktails; simply my kind of holiday! We hired some snorkel gear from the resort and went snorkelling in the mornings and late-afternoons. There’s an amazing reef just off the beach which starts from under the jetty. There were many types of corals – I especially loved the little ‘Christmas trees’ – and sponges which were home to lots of multi-coloured fish like parrot fish, angel fish, clown fish and some barracuda and baby black-tip sharks. My partner even spotted a giant turtle at the far end of the reef. In the evenings, we would have a drink at one of the cafés and watch the sunset before heading for dinner. And the sunsets were amazing! There are several cafés and restaurants along Long Beach but we chose to have our meals at the World Café at Bubu Villas or at The Bubu Resort because the food there, especially at the resort, was simply top-notch! The Bubu restaurants serve a big variety of Malaysian and Western dishes and they also have a large cocktail and wine menu. My absolute favourites were the seafood BBQ (one of the best I’ve ever had in Malaysia) and the sublime tenderloin steak. We went on a hike to a hilltop to check out this view! A glorious sunset appeared after a thunderstorm one evening. In the evenings, the beach transforms into one big lounge, with people sitting around bonfires. There are also several bars scattered along the beach. There was more to do on Perhentian Kecil than just laze on the beach. The resort has a spa with a cabana for massages right on the beach – the elderly Thai lady (they call her Ben ‘sadist’) did an amazing job of loosening up the muscles in my back. 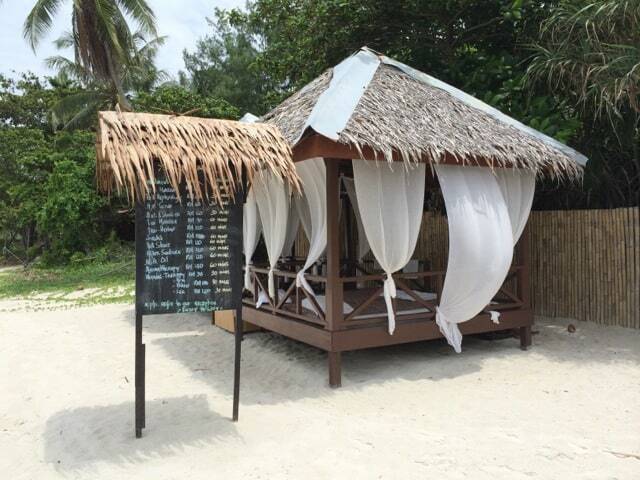 The cabana on the beach where Ben, the Thai masseuse, worked wonders on my back! Bubu Resort also takes guests out on day excursions to a secluded beach and does a BBQ lunch there. In addition, it also has a dive centre that organises boat trips for divers and snorkellers to sites around the island and to the surrounding islands. We went on a half-day snorkelling tour that took us to three nearby islands: Serenggeh, Tokong Burung and Rawa. Serenggeh, with its stunning reefs and breathtakingly clear water, was my favourite. At Tokong Burung, I spotted the large bumphead parrot fish, blue-spotted stingrays and a curious puffer fish. Bubu Resort offers a variety of snorkelling trips. 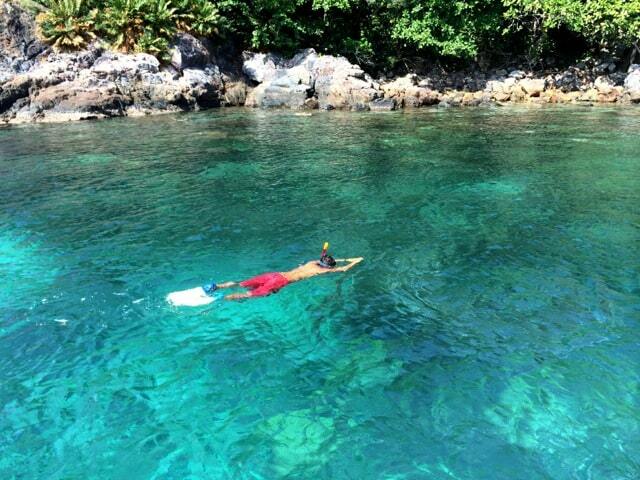 Snorkelling in the breathtaking waters of Serenggeh island. Tokong Burung island where I spotted a bumphead parrot fish and where a puffer fish swam up to me and winked! Pulau Rawa – don’t you think it looks like a turtle? It was supposed to be an offline holiday but I couldn’t help myself – the island’s drop-dead-gorgeous beauty inspired me to take lots of photos and share them instantly on Instagram. The free wifi at the resort definitely had a role to play in that. Haha! It was hard to leave after several days – we both wished we could stay longer – but we promised ourselves that we would return to the Perhentian Islands and the lovely Bubu Villas one day. Soon I hope! Note: a huge thank you goes to Bubu Resort and Villas for your fabulous hospitality and for making our stay so amazing! Thanks so much for your sharing! It has just been included in my bucket list for upcoming trips. I can’t believe that Malaysia has such a beautiful island like this. Mid-October should be good. The time to avoid is from late-November till late-January during the monsoon season. I think many of the resorts are closed during this time as well. hello there, may i know when is the best time to this island? oct mid can go? Wow! Certainly it’s a great post with awesome pictures encouraging for the backpackers to have a trip in Malaysia. Babu Resort & Serenggeh Island these two spots are really great where there appeared a mind-blowing scenic beauty indeed. Thank you Keith Jenkins! I wish you will be continuing your posting with different types of experiences. Good souvenirs of snorkeling on the main island! Wow! The pictures are eye soothing. I love the information that you have shared and since I am a big foodie I enjoy reading food and travel blogs. I liked your blog. Thanks for sharing it. Interesting read. As a Malaysian I am ashamed that I have not been to Perhentian. Keep postponing my trip. But your account will see it very soon. And the villa is gorgeous. 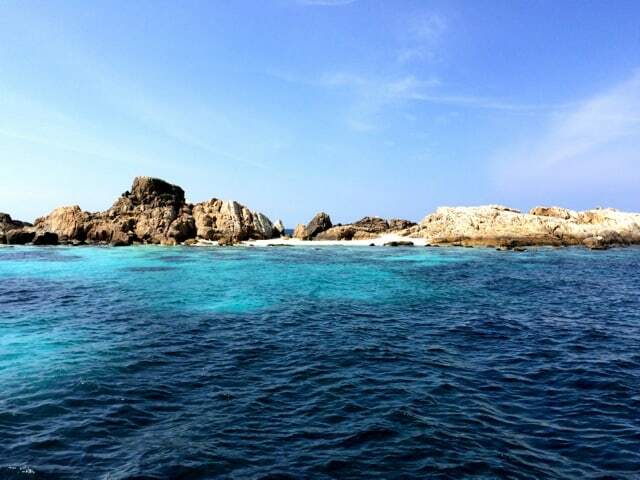 I missed out on the Perhentians … I had to choose between it and Palau Tioman, and I chose the latter. It was beautiful, but seeing what I passed up, I’ll have to check them out when I get back to SE Asia!